Heading into the National Hockey League’s annual holiday break, the Calgary Flames are in an unfamiliar position: first place. The Flames lead the Pacific Division at Christmas, and are among the top teams in the Western Conference. Given that the Flames struggled frequently last season and missed the playoffs by 11 points, their success this season has turned a few heads around the hockey world. But a few aspects of the Flames’ performances this season suggest that they could become Stanley Cup contenders as early as this season. The old adage is to win games, a team’s best players have to be their best players. For the Flames, they’ve gotten what they’ve needed from their usual offensive leaders, and they’ve been joined by a few new faces in Tkachuk and Lindholm. This quintet has been scoring a lot in every game situation – even short-handed – making the Flames a tough team to defend wherever a game may take them. Simply put, the Flames’ stars are winning them a lot of games, something that wasn’t always the case in previous seasons. As previously mentioned, the Flames have historically been a top-heavy offensive group with usually one line that’s a major threat to score. For teams with a good shutdown line or strong defensive pairing, beating the Flames has been a relatively simple proposition: throw your best guys out against Gaudreau and Monahan and try to out-score the rest of their line-up. This has meant that the Flames have had to bank wins on home ice, where they control match-ups, and try their luck on the road. But with Tkachuk and Lindholm joining the offensive fray, the Flames have been able to shuffle their lines away from the Scotiabank Saddledome and become a more balanced offensive team. That balance has shown up in a few ways. They’re one of the NHL’s leading possession teams both at home and on the road, with Corsi For percentages north of 50% wherever they play. They’re also one of the top teams in generating scoring chances, showing that even away from home they’re able to create offense. Their prowess shows in another, simpler metric of measuring success: wins. The club hit the holiday break with 22 victories, spread evenly between home and road games. The Flames haven’t been a perfect hockey club in 2018-19. They’ve given up a lot of early leads, their defensive zone play has been a bit chaotic at times, and their goaltending challenges early in the campaign have been well-documented. But they’re a group that’s found ways to win, something that wasn’t always the case with previous incarnations of the group – general manager Brad Treliving characterized the group as “fragile” in his 2017-18 season-ending press conference and former head coach Glen Gulutzan noted at times the team would “crumble” at signs of adversity. But the 2018-19 Flames have found ways to win, especially in big games. They lead the NHL in third period goal-scoring and are second in the NHL in third period goals against. They have lost just once when leading after two periods and lead the NHL with seven third period comeback wins when trailing after two periods. Because of their potent offensive attack, the group has the confidence that they can find their way back into games and they don’t have the emotional “drop-off” that’s often seen with teams that get into early deficits. They simply keep playing their same style of game and more often than not they’ve been able to score key goals at key moments and win key games. Moreover, they’ve been able to step up in big games against tough opponents. Coming off a pair of so-so efforts against the Vancouver Canucks, they shut out the powerful Nashville Predators 3-0 in the third game of their season. Following a 9-1 drubbing at the hands of the Pittsburgh Penguins on home ice, a game dubbed “rock bottom” by head coach Bill Peters, they grinded out a 4-3 overtime loss to the defending Stanley Cup champion Washington Capitals. They followed that game with a four game winning streak. In the first Battle of Alberta of the season they gutted out a 4-2 comeback victory over the Edmonton Oilers. Hosting the best team in the NHL, they went the distance with the powerhouse Tampa Bay Lightning and went to a 5-4 shootout loss. 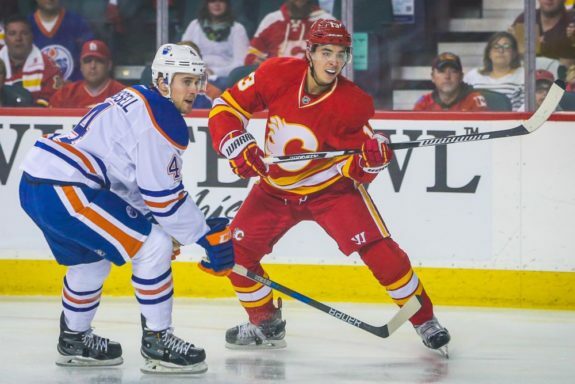 When the Flames have needed strong performances at key times of the season against tough performances, they’ve been able to rise to the occasion. The Stanley Cup playoffs are a two-month grind and often reward the deepest teams – and the hockey club is still a work in progress – but the Flames have shown to have these key attributes of teams that find post-season success.